It had been many years since I have seen such a large dark front and as soon as the winds came upon me I knew it was time to leave. The entire scene looked like something out of a disaster movie but I did like the combination of granite patterns, trees and storm clouds. 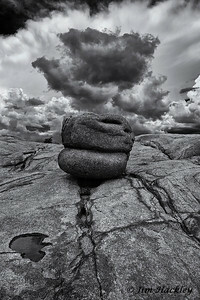 It is amazing how a little rain can really bring out the granite patterns. This canyon wall in the Dells has many wonderful granite patterns that can make for a nice abstract image. The Willow Lake water level usually goes down during the early part of the summer but will fill up again when we get the summer monsoon rains. 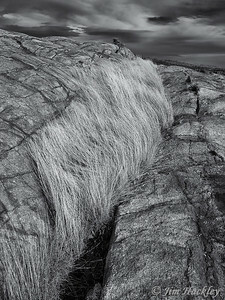 Some parts of the Granite Dells have these amazing patterns that will stretch over entire ridge tops and canyon walls. 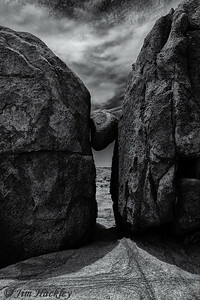 The Granite Dells can be an interesting place to find some wonderful rock patterns but during the Arizona monsoon months you need to be ready for any approaching storm. Amazing how calm things can be before or right after a storm. 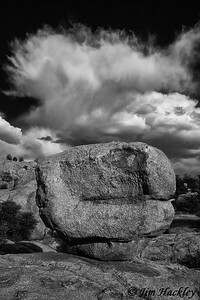 We had some amazing cloud formations in the Granite Dells with large forming thunderhead clouds combined with lower fast moving dark clouds. 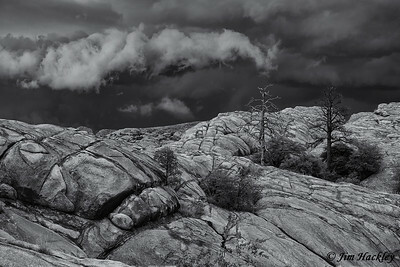 Sun light breaks through the storm clouds to highlight a ridge in the Granite Dells. Some of the granite patterns in the Dells contain circles, squares and then swirls. How did it all form and how long did it take? It is amazing to me when I find a lone big boulder along a flat plateau. The question that comes up for me is 'How did it get there?'. 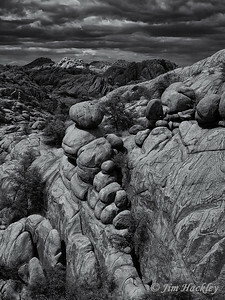 You just never know what interesting formation you are going to come across when hiking in the Granite Dells. Who knows how long ago this rock fell but I do not think it is going anywhere very soon. You never know what type of formations you can find in the Dells. 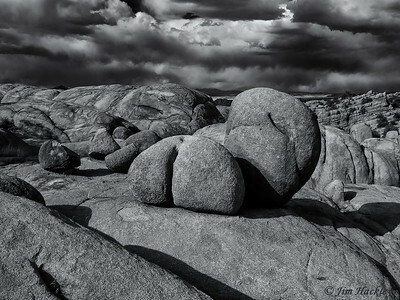 Over millions of years the erosion process has left some remarkable patterns and rounded boulders in the Granite Dells. Rock scrambling in the Dells can be fun but sometimes the way in is the only way back out of a slot canyon. 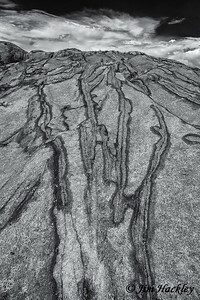 I was hiking along a ridge top in the Granite Dells when I came across this large split in the granite where some tall grass had grown up and it reminded me of flames coming out of the granite. Some of the slot canyons in the Dells can be hard to get in and out of, but then that is part of the fun. Some of the granite rock formations remind me of something so they get a name and is also used as a reference point once in the Dells. 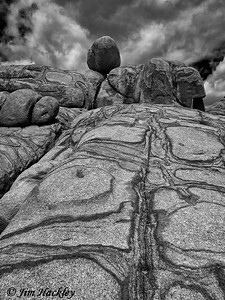 When hiking on top of granite fins you can find all kinds of interesting patterns. 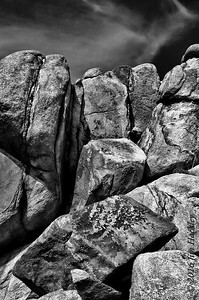 Hiking the Dells over the years I have started to name some rock formations that look like something. When I found this location the choice seemed obvious. Nothing like being at the right place at the right time. I was hiking in the Granite Dells as a storm front moved all around me when the clouds opened to illuminate this one peak. When hiking the in Dells you just never know what kind of granite formation you will find. These boulders appear to stacked up and balanced. One of my favorite trees to check out when I start my hike into the Granite Dells. You will see several variations of this scene depending on the background clouds and light. 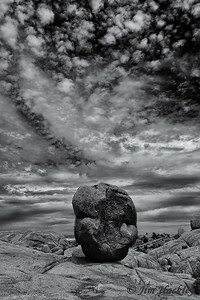 I was climbing along a granite plateau during a storm when I noticed this rock and the clouds swirling just above it. It almost seemed like two opposing forces getting ready to collide. This thin line of clouds came through the Granite Dells and lined up with these boulders as I was hiking a along a ridge top. This granite ridge is one of my favorite ways to enter into the Dells as it provides wonderful views during the summer thunderstorms.